University of Hawaii quarterback Colt Brennan talked with reporters yesterday in the UH athletic complex. 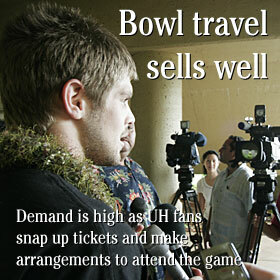 Travel agency demand is high as UH fans snap up tickets and make arrangements to attend the game. News reports of blackmail, extortion and a possible federal probe forced chief of staff Bob Awana to resign, says Gov.